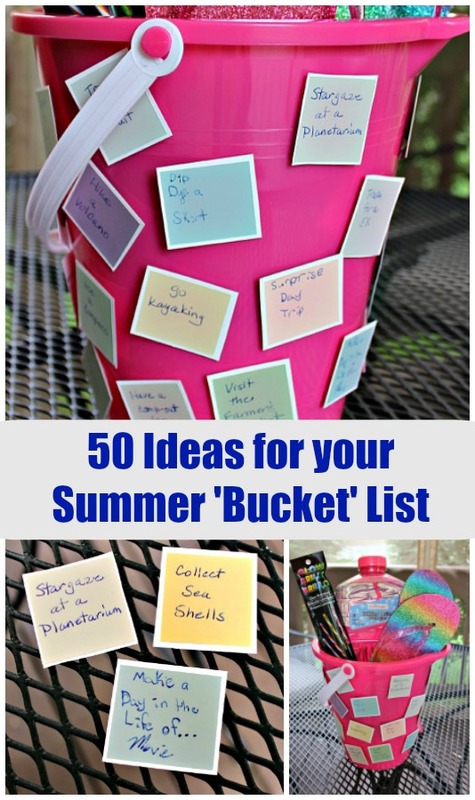 Make a bucket list of fun things to do with your kids this Summer! My kids tell me I've been acting extra goofy this week. Actually, we are quickly approaching summer and I am very happy about the prospect of the not-so-scheduled days and longer evenings to enjoy with the kids. So this week, we grabbed a few supplies and started working on our Summer Bucket List. 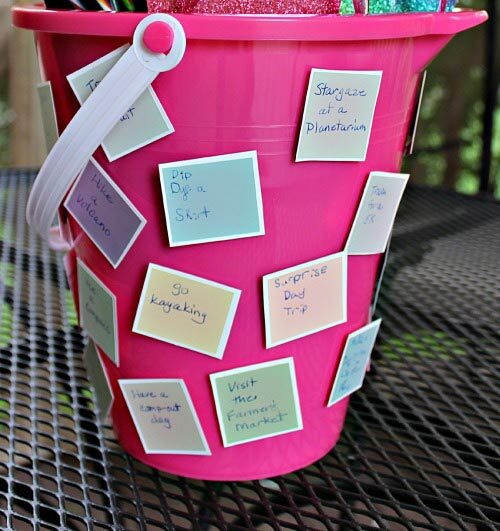 Yep, a bucket list on a bucket! This is where the kids mention said goofiness again while they were laughing at our ironic list. But we really like it! 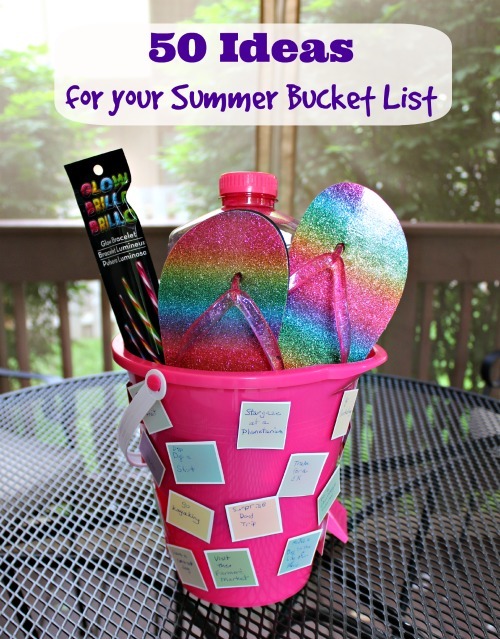 And to top it all off, not only does the bucket showcase all the items we’d like to enjoy this summer but it also holds some summer fun inside too! I even like it better than last year’s summer bucket list which resembled a periodic table for my science-loving kids. So how do you make one of these bad boys? Super duper easy and your kids will LOVE to help! We've included a step-by-step tutorial along with affiliate links for items you may find useful as you create your own bucket-list-on-a-bucket. First, cut the paint chips into the size you’d like – we used squares because I had a huge assortment of small square paint samples from when we were deciding on what color to paint the kids’ bathroom. You can also use a large fun shaped hole punch and punch out shapes for each of the items on your list. Next, write one summer activity on each of your punched out or cut out shapes. My daughter helped with this step (which I assume is because she thinks I would probably leave off some of the good things like "Have a Lemonade Stand" or “Fondue Dinner”). Now take the Velcro dots and stick the soft-side of the Velcro on the bucket. You can place them all in a line so your bucket looks like it is striped or just randomly stick them on in a polka-dot pattern. Then the rough side of the Velcro dots is put on each of your summer activity paint chips which are then attached to your bucket. 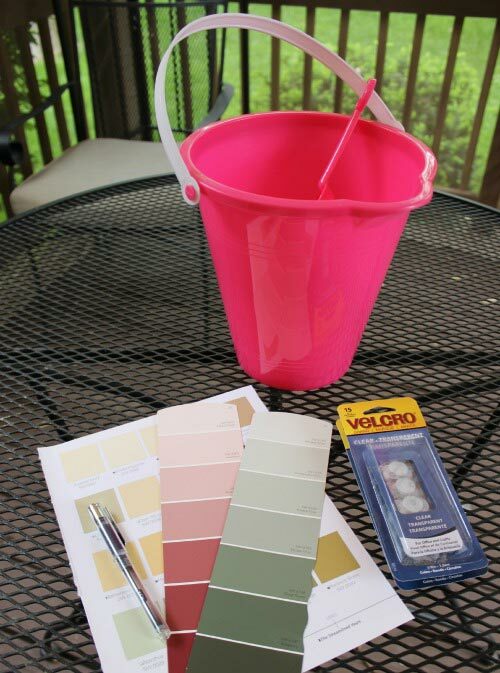 Now each time you check off an item from the list, your kids can pull off that square and toss it into the bucket. Hmm… I wonder if this could work as a chore chart too? May have to try that – or maybe I can sneak in a chore square on the bucket and they’ll never know. 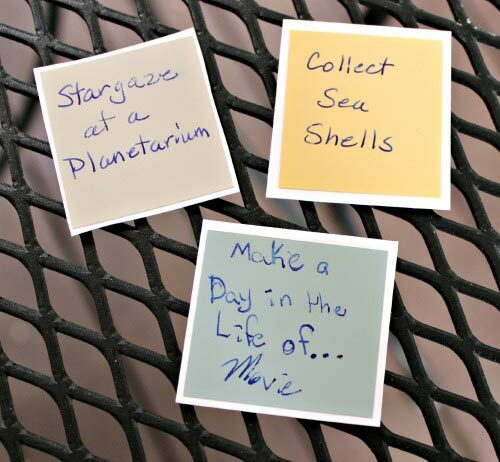 So what creative ideas & activities can you add to your summer list? Here are some of our plans for this summer! 30. Have a few family movie nights -- We love the ones on this 25 Kids Books made into Movies list! So what's on your bucket list for this summer?